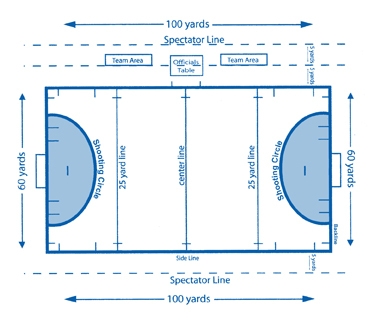 Field Hockey is played on a field which is 100 yards long and 60 yards wide. Top-level field hockey is played on synthetic surfaces, which makes the ball run faster and more smoothly, but most high school games in the US are played on grass. The high school game consists of two 30-minute halves. Each team is permitted two time-outs per game. The game is started and re-started after every goal by a center pass. The player taking the center pass puts the ball into play in any direction using a hit, push, or self-pass. The object of the game is to work the ball into the shooting circle -- a semi-circle extending 16 yards from each goal line and score goals. Goals can only be scored when touched by the attacking team’s stick inside the opponent’s shooting circle. (This is an important rule to understand, since there are many times when a goalkeeper will allow the ball to enter the goal when she knows that it has been hit from outside the circle.) Each goal is scored when the ball completely crosses the goal line between the goal posts and under the crossbar. If the ball is lifted into the goal, the umpire may rule that it was a dangerous hit and may disqualify what looked to be a goal.